VimHost - What is a Support Pin ? What is a Support Pin ? A Support Pin is a quick account verification code that you can use to verify yourself as the account holder during a live chat and phone. You may obtain the support pin by logging into the client portal. There are two types of Support Pin. 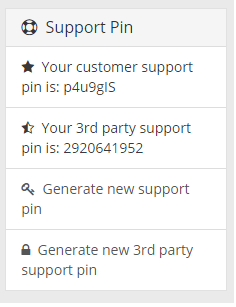 3rd Party pin: This pin will allow the individual/company that hold the code to perform only hosting specific requests, such as technical support or any changes made in the hosting environment. This pin is designed for customers who regularly hire outside developers or freelancers who wish to grant them hosting access. When providing these pin to our support agent. Please also include your full name or email address on file. You should see something similar in the Client Dashboard. I'm getting intermittent connections, how do I troubleshoot with MTR ?